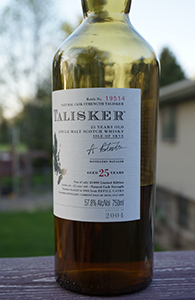 In my review yesterday of the Talisker 18 from 2007 I noted that I’d purchased that one for $49 in 2007 right before the price started climbing steadily. 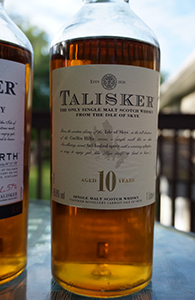 Well, in early 2012 when the average price for the Talisker 18 was at $80 or higher in the US a well-known store in Kentucky (which no longer ships) offered it at $59. Once again, I was an idiot and only got one bottle. It was right after this that the 18 yo disappeared briefly and then returned in new packaging with the shocking $140 price tag. I’ve not bought any since or tasted any Talisker 18 from 2012 or after, but am happy to report that this iteration from 2011 is pretty good. 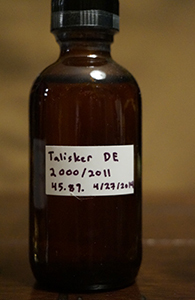 In yesterday’s review I noted that the Talisker 10 packs quite a punch at 45.8% and would likely be a monster at cask strength. 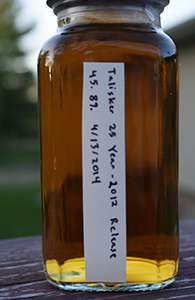 Well, the Talisker 57 North is at 57%. It’s not a 10 yo, however. No age is noted but the rumour is that it is mostly 7 years old. Of course, as no age is noted the distillery can change the mix from batch to batch without having to change the label. This was originally available only in duty-free but can now be found in regular retail too (though not in the US). It may now be the only non-stratospherically priced official release at a high strength. As to whether that will last or this will give way to its NAS brethren at lower strengths remains to be seen. This particular bottle is from 2013. 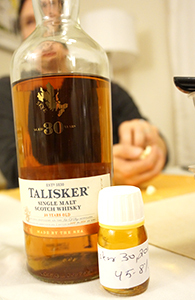 The Talisker 10 is an all-time classic and one of my favourite whiskies…except I don’t think I’ve had it in more than a couple of years (as per my spreadsheet, not since October 2010 but that seems unlikely). Word on the street is that its quality may have slipped. As always with Diageo, it is hard to separate dislike of the giant global conglomerate and its practices from one’s feelings about individual products. At any rate, I can’t judge potential decline here as this (recently opened) bottle is from 2009 which is probably from before the narrative of decline kicks in. 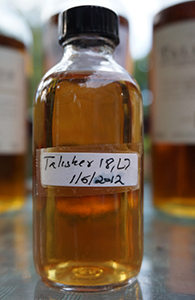 After yesterday’s somewhat disappointing Talisker 25 from the 2012 release here is a very different beast altogether. Released in 2004 this is at 57.8% and is not very tame indeed. It was the star of our local group’s tasting of older whiskies this past February and I’ve been drinking the rest of the bottle down at a steady clip. Time to review it before it’s all gone. And speaking of “all gone”, until recently it was possible to find this in the US for less than $200–those days are probably also all gone. The label says this was a release of 21,000 bottles filled from refill casks. What kind of refill casks is not specified, but from past experience I’d wager there’s a fair bit of refill sherry in here. 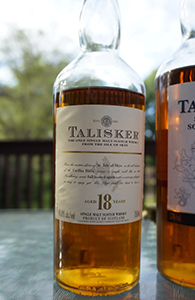 A few years ago Diageo downgraded the respected Talisker 25 from cask strength to 45.8% (the standard Talisker strength). As you can imagine this was not a popular move among whisky geeks, especially as the price did not go down in the process. (The same thing happened to the Caol Ila 25.) 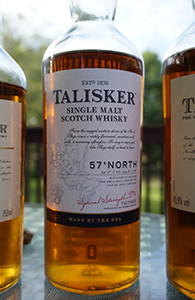 As to whether this is a short/medium-term thing to address shortages of matured stock and to save enough casks to mature further for super-premium releases such as the recent Talisker 28, 1985 “Maritime Edition”, I don’t know.